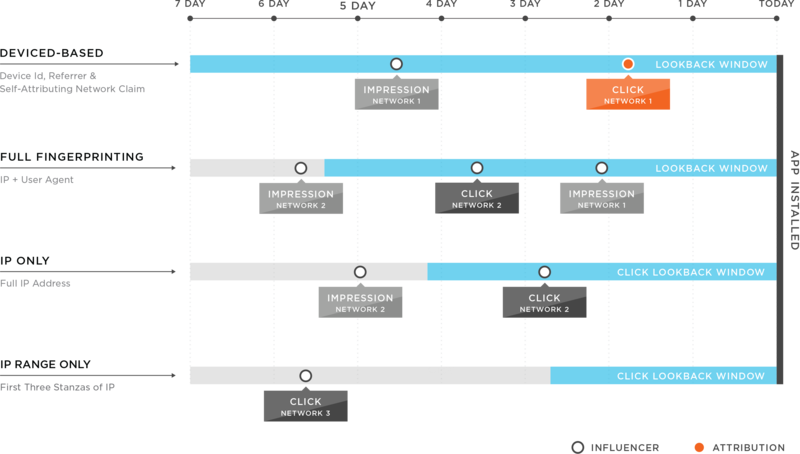 Influencer report takes into account all of the clicks and impressions made across networks which led to the install. The Influencer report takes into account all of the clicks and impressions made across networks which led to the install. The current industry convention is to attribute installs and events based on the last click. The Influencer report sheds more light on the topic of attribution by surfacing all clicks and impressions that may have occurred but did not receive final attribution. This insight is critical to understanding brand lift as well as true ROAS (return on ad spend). The Influencer report makes it easy for advertisers to compare the sources driving traffic with the sources that are driving installs or events. As shown above, there are several influencing clicks on networks other than the network awarded attribution. While the click on Network 1 was awarded the “winning click” Network 2 had four clicks by the same user. The Influencers report provides row-level data about each click including site ID, creative ID and the reason it did not win final attribution. These reasons may include being outside the lookback window, not being the last click, or being superseded by a higher match-type (for more information on match-type, refer to attribution overview). The report also delineates whether there was a Self-Attributing Network (SAN) claim on the install. This means that if a SAN like Facebook, Twitter or Google claimed the install, there is also a false claim flagged against these SAN installs, if under normal reconciliation another network would have been attributed. For advertisers, the influencer data can be viewed in two different forms, the Influencer Summary which displays data at an aggregate level, or the Influencer report which displays data at the device level. 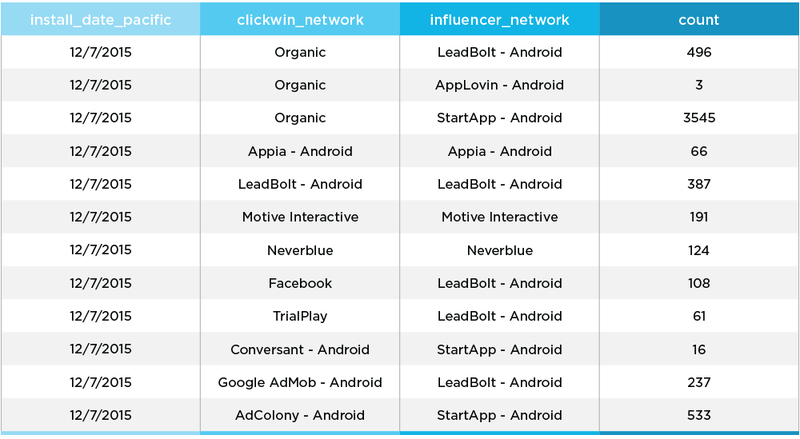 The Influencer Summary provides a high level overview of the click-win and influencing networks. Included in this report are the date the click happened, the clickwin network, the influencer network and the count. The Influencer report shows the real impact of the UA (User Acquisition) spend. 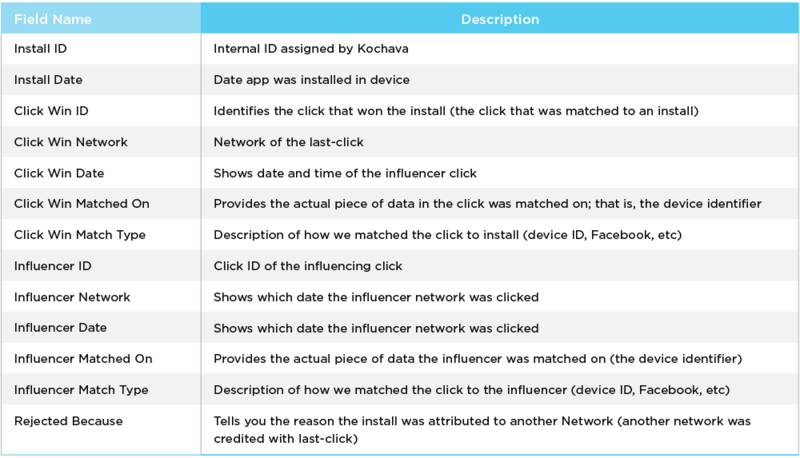 The Influencer report is a row-level breakdown of clicks which did not win attribution for a given install, but still influenced the install. This report provides insight into the full impact of your campaigns including brand lift. Note: For clarity, the below report example has been separated into two different images in order to clearly display the full report. The Influencer report provides the actionable intelligence to manage marketing budget and understand true ROAS (Return on Ad Spend) based on the networks that are driving traffic and not just the networks that received final attribution, enabling a more focused disbursement of advertising funds and higher yields.